This little embroidery is a Susan O’Connor design from “Inspirations” # 50 magazine. “Inspirations” is my favorite embroidery magazine. The designs are beautiful and the instructions are detailed with lots of photographs. I had heard of stumpwork embroidery and seen historical examples. It really didn’t catch my interest until I saw this design. Now I have purchased several books and want to explore it more. 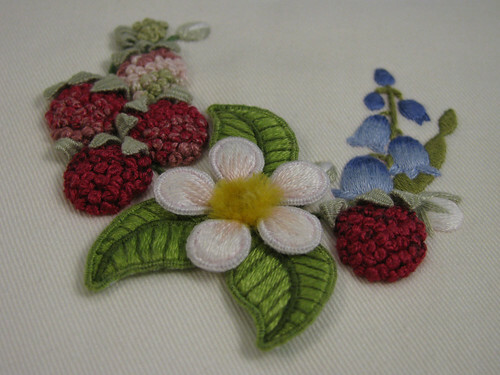 The raspberries and center flower are worked first on separate pieces of fabric. The raspberries are done in French knots, and then cut out with a seam allowance that is gathered to the back before appliqueing. The leaves and center flower are worked with cake wire buttonhole stitched to the edges. The best kind of wire has a paper covering. There are so many interesting techniques in this piece. I would recommend it for anyone wanting to learn the basics of stumpwork embroidery. This entry was posted on Wednesday, November 5th, 2008 at 3:00 am and is filed under Embroidery. Tagged: Embroidery, Stumpwork. You can feed this entry. You can leave a response, or trackback from your own site.